Last Friday, I left home on an unexpected whirlwind trip to the Deep South. I live in Kansas, where Dorothy put it best: There’s no place like home. Unfortunately, I couldn’t just click my heels and arrive. It was a 15 hour drive to and fro, each direction taken in a day. Not-so-surprisingly, since I was the driver, I didn’t accomplish a bit of stitching while on the road. I’ve not perfected the “stitch anywhere” approach to embroidery – I can’t quite do it behind the wheel. We have to draw the line somewhere, after all, don’t we? Thanks for all your well-wishes last week. Now that I’m home, I’m chomping at the bit to get some major things accomplished! There’s something about summertime – picnics, Fourth of July, family barbecues, parties – that just hollers for gingham embroidery! I love picnic decor in the summer, whether it’s inside or out, so I’m having some fun playing with “chicken scratch” – some free designs and a tutorial for an upcoming article that I’ll share with you when it’s published. 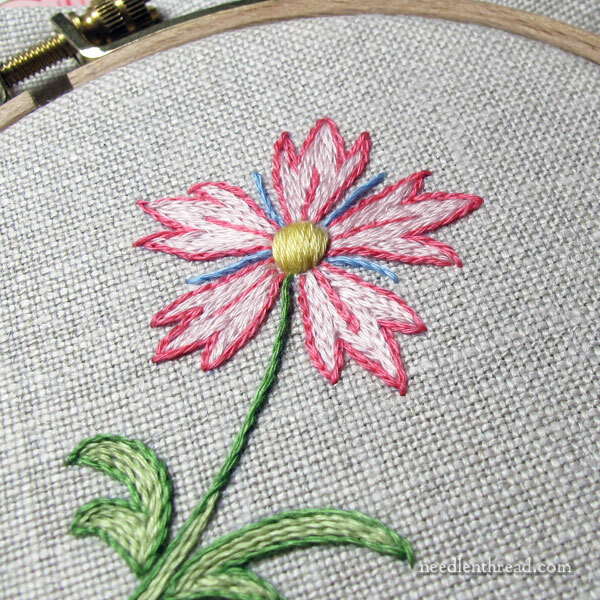 Several of you asked for close-ups on this little flower stitched in floche that we looked at on Monday, when chatting about color choices in embroidery. This is as close-up a picture as I have. It’s just a little sample, whipped up to demonstrate floche and what it can be used for in surface embroidery. The flower petals are worked in split stitch, outlined first in dark pink and filled with split stitch in light pink. The center is worked in satin stitch, and the little blue spikes and the stem and leaves are all worked in stem stitch. That’s the nice thing about floche – it fills well with simple stitches! Last night, I put some stitches into Late Harvest, indulging in stitching for pure relaxation. Sometimes, it’s just necessary! I’ll show you progress on that project down the road. I’m embroidering a monogram in floche right now. If I don’t mess it up, I’ll show it to you. Heck, even if I do mess it up, I’ll show it to you! Today, I have to set up a Big Project (I’ll sneak some peaks to you along the way), work up some more samples of shisha embroidery using a different thread and other things besides mirrors, figure out a plan of attack for the six-mile-long To-Do List that mysteriously developed over the past seven days, and catch up on the website and on email. It’s so good to be home! I sure missed my Needle ‘n Thread chums! I think the rest of the summer should progress with little interruption. Whew! I was wondering where you were and starting to worry that something not nice had happened to you. You’re right. No place like home, and I’m glad you’re back safe and sound. It’s sssssssssoooooo good to have you back I’ve missed your blogs and my comments which helps just before I indulge in needlework for the afternoon. Well there’s seems to have been a lot of project gathering while you were away. 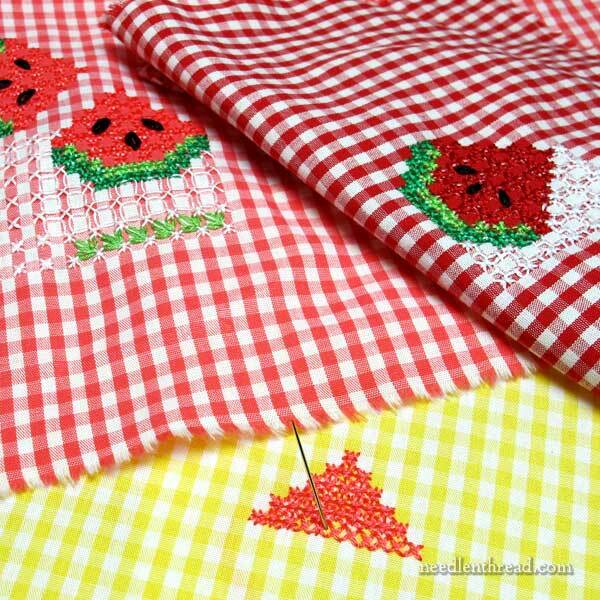 The gingham embroidery looks interesting and I look forward to the free designs and tutorial. I look to photos of your monogram in floche as well as your new big project that sounds exciting. I can’t wait for the samples of Shisha embroidery. I hope you have a restful weekend by which I mean needlework. Hope you’re aunt is doing better, and glad you’re home safe, Mary! Hope your aunt is doing better. It’s good to have you back! Hope you had a fine trip home with no falling asleep behind the wheel. Glad you made it there and back, Mary. Looking forward, as always, to your posts. Welcome home! Whew, our drive to our new place from here is 13+ hrs. and I hate that drive. 15!!! Goodness! Glad you are safe and sound and hope all is well with your family. Now… back to the fun. 🙂 Looking forward to your summer posts. Welcome home, Mary. I laughed when you talked about your 6 mile list developing over the past 7 days. I know that when I am driving (and can’t be stitching) my mind just comes up with all kinds of thoughts!! Plans, ideas, “gotta do” stuff!! Thankfully, when I get out of the car, the thoughts just fly away — never to be seen again — but some stick, and I end up with those 6 mile lists!! Glad you are home. Hope all is well. Also let me apologize for the heat down here (Florida). Glad you are back and hope you are enjoying stitching for relaxation for a change. Do you have a pattern for this cute watermelon? 15 hours is such a long road trip, and you had to do it twice! You have my complete sympathy. I hope you kick back and really unwind this weekend, you certainly deserve it. And I love it when you do the gingham embroidery, always so much fun! Glad you are home safe. I’ve never been able to stitch in a car….. makes me a bit car sick. Really missed you yesterday (we are such creatures of habit! Get up, grab a nice cup of tea, see what Mary is up to.) Enjoy your summer! Harvest. I started Pertinacity in Crewel Intentions and the needle lace and needle weaving stitches have stopped me dead in my tracks! Oh my, is it ever so easy to create a new stitch out of an existing stitch! This is one of the reasons I am so grateful for your videos. Diagrams sometimes make me cross-eyed just trying to figure out the path of the thread! Anyway, need some encouragement to tackle needle lacing and weaving. When I get desperate I think about other stitches that have the same look and effect . Lynn S.
Ah, you’re home again and all is right with the world. I’m so happy you had safe travels (unlike poor Ms. Joan Elliott -fabulous cross stitch designer) and I do hope you had a lovely time with your aunt. I’m anxious to see what other projects you have lined up for us all. Next Next post: Society Silk Embroidery – a terrific remix!